Professor Who Said Christians, Muslims Share A God Is Leaving Christian College : The Two-Way Larycia Hawkins says she expressed solidarity with Muslims; evangelical Wheaton College said she contradicted its statement of faith. Hawkins, who faced possible termination, is leaving the school. 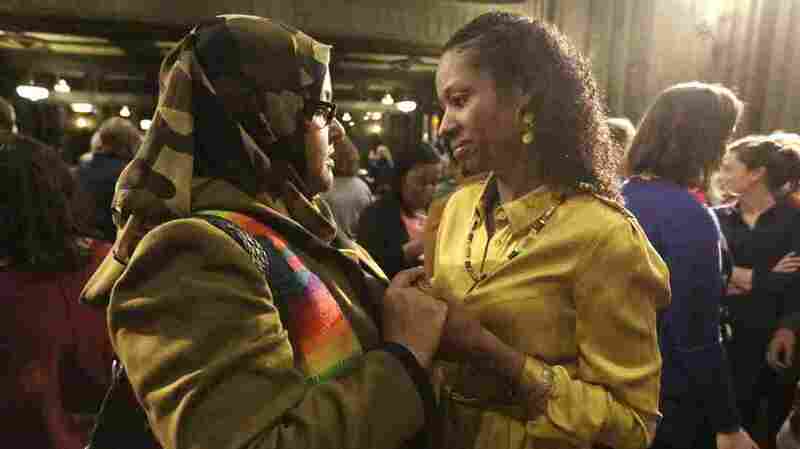 Wheaton College associate professor Larycia Hawkins (right) is greeted by supporter Donna Demir after a news conference on Jan. 6 in Chicago. Hawkins, who's Christian, was suspended by Wheaton, an evangelical Christian school, after she said Muslims and Christians worship the same God. Administrators initiated steps to fire her. On Saturday the professor and school announced they'd parted ways. A professor at an evangelical Christian college who was suspended for saying Christians and Muslims worship the same God will no longer be teaching at the school. As we've reported, Larycia Hawkins, an associate professor of political science who had tenure at Wheaton College in Illinois, was suspended from her job in December. She was put on paid administrative leave after vowing to wear a hijab for Advent in solidarity with Muslims — not because of the headscarf, but because of a Facebook post about her decision where she wrote about the relationship between Islam and Christianity and said, "as Pope Francis stated last week, we worship the same God." Wheaton administrators said they were concerned that post contradicted the school's statement of faith. Hawkins faced the possibility of being terminated from her job. But before her scheduled hearing, she and the school announced they had agreed to part ways — and wish the best for one another. In an interview with NPR's Michel Martin last month, Hawkins stood by her statement, saying, first of all, it was primarily an expression of solidarity — not an attempt to challenge any theology. But she also said that saying Christians and Muslims are people of the book, with a shared God, doesn't contradict evangelical faith. She was never denying differences between the two faiths, she says. "They're two different religions. And we diverge on questions of salvation, soteriology — how do you get to God? — and also on questions of Christology — who is Christ?" Hawkins said. "I can't intuit ... how they deem me inconsistent with the statement of faith ... when Wheaton College['s] president and provost and an adjunct faculty member in 2007 signed a statement saying exactly what I said — that Muslims and Christians are people of the book, we worship the God of Abraham." In her interview with Michel Martin, Hawkins said she wanted to remain at Wheaton. "I have spent most of my adult career committed to being a professor, a scholar and doing so in a Christian context, where I can live out my beliefs but continue to push my students towards rigorous scholarship in this evangelical environment," Hawkins told Martin. "And so I'm known on campus for challenging people to think outside of the box, and presumably that's why Wheaton wanted me." She was originally scheduled for a hearing late next week to determine whether she would be terminated. Instead, on Saturday night the professor and the college released a joint statement saying they have "found a mutual place of resolution and reconciliation" and "reached a confidential agreement under which they will part ways."